At a time when he was a member of the legendary Clifford Brown/Max Roach sextet, Sonny Rollins was still the apple fallen not too far from the tree of Miles Davis. 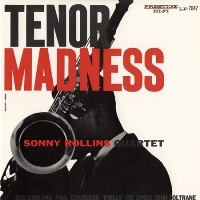 Tenor Madness was the recording that, once and for all, established Newk as one of the premier tenor saxophonists, an accolade that in retrospect, has continued through six full decades and gives an indication why a young Rollins was so well liked, as his fluency, whimsical nature, and solid construct of melodies and solos gave him the title of the next Coleman Hawkins or Lester Young of mainstream jazz. With the team of pianist Red Garland, bassist Paul Chambers, and drummer Philly Joe Jones, staples of that era's Miles Davis combos, Rollins has all the rhythmic ammunition to cut loose, be free, and extrapolate on themes as only he could, and still can. This is most evident on his version of "The Most Beautiful Girl in the World," started in its normal choppy waltz time, followed by a sax/drums prelude, a drum solo from Jones, and steamed from there on in, a hot 4/4 romp. Garland is particularly outstanding for keeping up the pace, depth and placement on this one. A bluesy version of "When Your Lover Has Gone," again enlivened by Jones, and the legendary title track with Rollins and John Coltrane trading long solos, and fours with Jones, are tunes that in the mid-'50s defined the parlance "blowing session." "Paul's Pal," in tribute to Chambers, has become a standard in its own right with a bright, memorable melody showing the good humor of Rollins, especially on the second time through, while the saxophonist's ability to sing vocal like tones through his horn is no better evinced as during the light ballad "My Reverie." A recording that should stand proudly alongside Saxophone Colossus as some of the best work of Sonny Rollins in his early years, it's also a testament to the validity, vibrancy, and depth of modern jazz in the post-World War era. It belongs on everybody's shelf. Recorded May 24, 1956. Mono. Originally released by Prestige (P-7047). This reissue released in 2013 by Analogue Productions.